Smash against our windscreen, and slip their way through the front grill of the van, into the vents blocking our ability to get natural air piped in. It was a sick experience as we drove 200k's just before the Fitzgerald biosphere and into Esperance. They came down from the sky like a magnificent hail storm, smacking against the glass windscreen, and smashing into balls of brown goo upon impact. Even more of a sight were the hundreds that wedged themselves into the strange basket that protrudes from the front of our van, across the front midsection. Now we know what this fine feature of our van is for, capturing large bugs and attempting to prevent them from hitting the screen. As we made our way through the locusts blizzard, we did our best to find other big cars to trail behind, hoping to get less of the carnage on us, but it didn't work- not only were these beings hitting us from the sky, but they were also jumping up from the road, and gift-wrapping the entire bottom and lower grill of the van. We stopped of at a petrol station to scrape off the wreckage, and noticed a bulk of them were still living! They started falling off, or some were flying off half alive and in shock, and then the worst part of it all, the aftermath, with a ton of flies swarming to feast on the splattered bodies all over the front of the car. It was quite a sight, Darrin out the front of the windscreen, with squeegee and toilet scrubber in hand (don't ask where he got the toilet scrubber from), fending off the lot from the grill and windscreen like an experienced sword fighter. 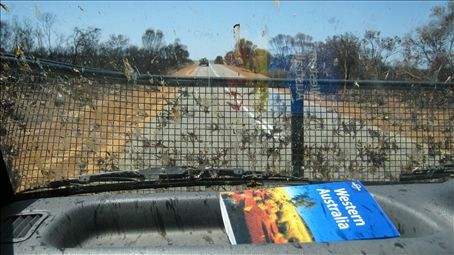 I don't know what's worse, dead bodies of locusts all over the windscreen, or feces from the toilet scrubber. But the fearless Darrin cleansed the car, hopped back in, shaking off the flies, and off we drove back onto the highway and it all started over again. We finally arrived Esperance, people pointing at the carnage all over the van that we could no longer remove, not just because they had baked in the sun for the past 3 more hours of driving, but because no other petrol stations had the toilet brush scrubber that worked so effectively at getting them off. We pulled into our new campsite, and have noticed that no one is parking anywhere close to us tonight.